The Mimaki UJF-3042FX is a desktop size UV LED inkjet printer that offers the ability to print high quality images upto 1200 x 1400dpi onto virtually any uncoated substrate upto A3 in size (300 x 420mm). 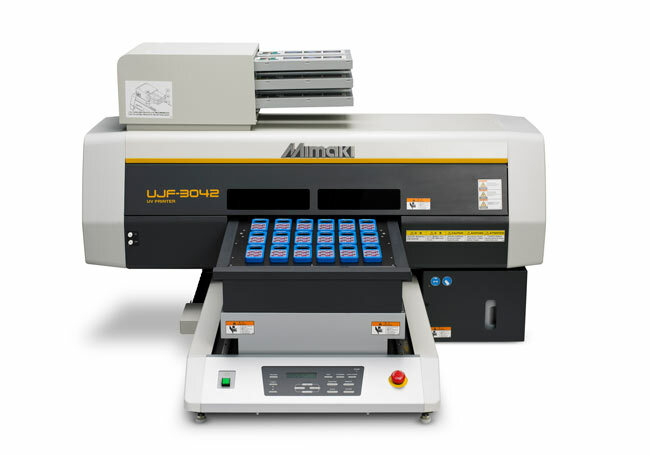 With the latest LED UV lamp technology the UJF allows imaging onto substrates that would normally be unsuitable due to their sensitivity to heat that is normally present when normal UV lamps are used. With applications being endless and including but not restricted to commercial labels, badges, packaging, stickers and display products there is also the opportunity to produce personalised products such as phone covers, promotional goods, giftware and membrane covers. All with the option of White ink!! Traditional digital print medias can all be imaged and also products such as wood, metal, glass, ceramics and plastics can be used to create a unique result. Again the White ink allows for printing onto colured substrates when used as a base layer to ensure vibrant results on non white media such as wood or metals. With the option of being used to flood coat a whole image or individual areas of print the White ink truly makes the UJV 3042 a flexible tool for any application.